The ancient Romans admired Campania Felix as the most felicitous of wine regions. Over the last decade, the region of Naples has dramatically improved the quality of its modern wines, now classifying nearly 90 percent as DOC or IGT. Things are truly changing in Campania’s vineyards, where a new spirit of achievement and sense of pride has been bolstered by the introduction of thoroughly modern wine-making techniques. Evidence of the new era is the elevation of three ancient wines to the elite category of DOCG: Taurasi, Fiano di Avellino, and Greco di Tufo. The Romans favored the vineyards along the coast north of Naples where Falernian, the most treasured wine of the empire was grown. They also praised the wines of volcanic Vesuvius and the wooded hills of Avellino. Even earlier, the Greeks had recognized the priviledged nature of the place, introducing vines which still stand out today as Agilanico, Greco and Falanghina. Modernization has by no means swept away respect for tradition. In Campania, a majority of producers strive to make the most of native vines, including an honor roll of so-called “archaeological varieties” which do indeed date back to antiquity. The noblest of the red varieties is Aglianico, which makes the red Taurasi, as well as the red Falerno del Massico and others. Taurasi has been called “the Barolo of the south,” due to its size and ability to age, though its style is proudly its own. Greco, a name applied to various vines prominent in the south, reaches heights in Greco di Tufo. Fiano, praised by the Romans, is the base of the inimitable Fiano di Avellino. Falanghina, which seems to have been the base of the white version of Falernian, has become the region’s fastest spreading variety. Campania’s DOC zones also include the fabled islands of Capri and Ischia, as well as the recently revived Penisola Sorrentina and Costa d’Amalfi, taking in the terraced seaside vineyards from Sorrento to Amalfi. The region ranks 12th in size (13,595 square kilometers) and second in population (5,793,000). 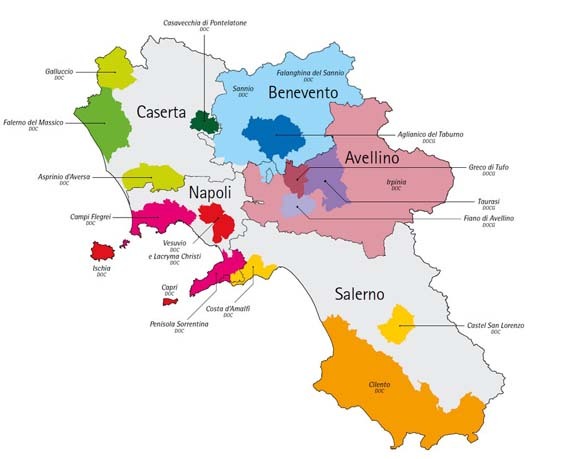 Campania’s average annual wine production of 1,770,000 hectoliters (9th in volume among the regions) includes 10% DOC/COCG. Red wine accounts for about 60% of Campania’s production.